I write this with a very specific audience in mind – specifically future Alt For Norge cast members, whether you’ve been chosen for Alt For Norge Season 10, or any other subsequent season. Take all that I write with a grain of salt, this comes from my particular perspective and experience – the experience of someone who was on the show for 6 out of 10 weeks – but nonetheless, if you can glean one tip it’s likely worth the 4 minute read. You are in for one of the most amazing/spectacular/otherworldly/surreal experiences of your life. You will look back a year from now and it will all seem like a dream. You won’t know what’s going on and you’ll have very little control over your situation, and that’s okay. Some people have trouble dealing with so much unknown. Where are we going? What are we doing? What’s the competition going to be like? In a sense it’s like a beautiful roller coaster where you have no idea what’s around the corner, but again and again and again you’ll find something amazing. It might be tough to completely “let go”, but the more you can go with the flow and enjoy the ride, the better experience you’ll have. The competitions are real and the producers don’t choose favorites. The producers work VERY hard to make sure that each and every competition is fair, and no team or individual has a leg up over another. Don’t overthink who’s on what team. Let’s put it this way, if I’m a producer, I don’t want Heidi out first, but that’s just how the chips fell in our season. There is a TON of luck involved – so much of how you do on the show will come down to dumb luck. Struggle finding orange juice in a fridge? End up with a robot baby that cries too much? Mess up a game of charades? Take 10 minutes to read and repeat 5 words? These are all reasons you may have to leave the show. The sooner you realize how much luck is involved, the less stressed you’ll be, and the better time you’ll have. Have some perspective – you just won a free ~15 day all-expense paid trip to Norway where you’ll have experiences and get to be a part of something 99.99% of people could only dream of. If you happen to make it past the first elimination – sweet! You just won the jackpot AGAIN – another ~7 day all-expense paid trip! You will never know where you’re going: Have you ever heard of Flåm, Undredal, Stryn, Ulefoss, Dalen, Vardø, Hamningberg, Asgardstrand, Valldal, Syden, or Grimstad? I didn’t think so. You have to remember, Alt For Norge is a show that allows Norwegian’s to see their own country through the virginal eyes of Norwegian American’s who are experiencing Norway for the first time. Most Norwegians have never visited the places you’ll go. It’s almost a travel show disguised as a reality TV show. For this reason, you won’t be spending much (or any) time at typical Norwegian tourist destinations. Bryggen in Bergen? Forget about it. (UPDATE: They went to Bryggen in Bergen in the first episode of season 9 lol) Trolltunga? Unlikely. Geirangerfjord? Nope. Pulpit Rock? No way Jose. Viking Ship Museum? Probably not. The producers, crew, editors, and directors are all genuinely looking out for you. They may ask you some silly questions during interviews to try and prod an answer out of you, but they want you to shine. This isn’t like American reality TV where people are pigeonholed or edited to seem like someone they’re not. The show aims to paint everyone in a really good light. They shoot 36 hours of film for each 1 hour episode. That time you said something embarrassing or stupid – it’s almost certainly getting left on the cutting room floor. Again – don’t worry about how you’ll be portrayed on TV. Focus on what is filmed: This might be my most useful actionable tip. If the individual competition ends up being a quiz or requires you to remember things you learned during the week – you’ll almost certainly only be tested on things that were filmed. Don’t try to learn Norwegian ahead of time – try to learn techniques for committing foreign phrases to short term memory. You’re not going to be able to learn an entire language before the show, but if you can spend an hour and learn memorization techniques, they might come in handy. Don’t try to learn Norwegian ahead of time – attempt to learn how to control your emotions when your adrenaline is going 100 MPH. When you’re in the moment and the clock is ticking and the stakes are high, adrenaline might help your physical performance, but it tends to hamper your mental performance. Bring a Portable Speaker and an iPod classic: You’ll be glad you did. Pack super light! You’ll be given lots of clothes initially, and more as the show goes on. By the 3rd or 4th week, most of us were asking if we could ship stuff home. You will eat like a king. When you get kicked off the show, the producers will tell you “The journey is just starting.” At the time you won’t believe them, but there’s a lot of truth to it. It won’t be for another 3-4 months after you’re home that the show will go on air… and watching yourself on a reality TV show is one of the most surreal experiences ever. It will feel less like a TV show… and more like an amazing travel video made for you and your close friends. Prepare by watching: The best way to get an idea of what’s in store is to see the actual show. It’s often difficult to find previous episodes, but if you hunt around enough you just might find a few clips here or there or there. In order to watch Alt For Norge in the United States you have to have access to DPlay (it’s kind of like the Hulu of Norway). As a contestant you’ll get a DPlay log in, BUT in order for your friends to sign up for DPlay, they’ll have to have a Norwegian credit card! Because of this… watch parties are the way to go! I threw a watch party for every episode, with one or two “Double Feature” weeks thrown in. Legitimately, the first watch party was one of the coolest days of my life. 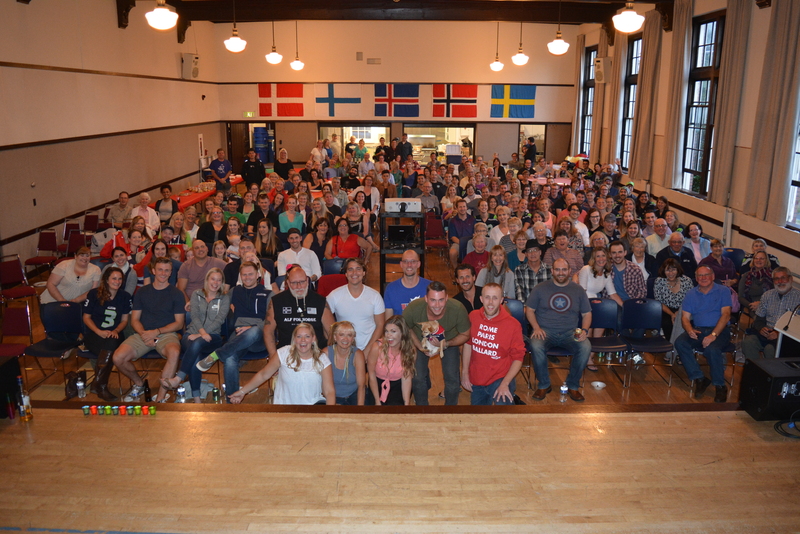 We had over 190 attendees, including 4 of us from Season 7, and about 8 former cast members who live in the area. (UPDATE: If you look close… my friend Odessa Stevens is towards the back… she applied for the following season, got on the show, and won the whole thing!) My first tip: Delay your watch parties by at least one week: Episodes come out online essentially right after they air in Norway (right around noon on Sunday in the states). As tempting as it may be to have your watch party that very night – if there is any sort of an hiccup that causes the episode to be posted later than expected (happened 1-2 times out of 10 episodes), you’ll be left with a group coming to your party and nothing to show them. My second tip: If you have big watch parties, make them all potlucks – then you don’t have to worry about how many people show up or how much food to prepare. Todd Ferris’ Blog – Why learn from me when you can learn from a guy who won the whole dang thing back in Season 3! Kate Mills’ Blog – Why learn from me when you can learn from the girl who took second place in my season! Her Alt For Norge Survival Guide in particular is great – particularly for girls going on the show.